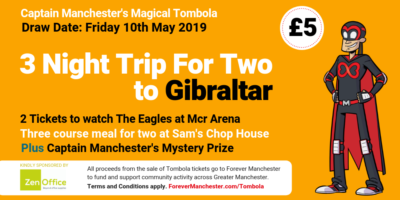 In simple terms Forever Manchester is a charity that raises money to support grassroots community activity across Greater Manchester. Astonishingly, there are something like 180,000 registered charities in the UK that raise and spend close to £80 billion a year and make 13 billion ‘asks’ for donations every year, the equivalent of 200 for each of us in the UK. The top 20% of these charities, the household names, receive 80% of all the money raised and the top 20% of the top 20% receive 80% of that income. Almost 80% of all the money donated to charity by the businesses and people of Greater Manchester leaves the area. You know the names of the most successful charities because they behave like blue chip corporate organisations, they rub shoulders with government ministers and the super-rich because they have central London addresses. They have teams of well-paid fundraisers, utilise the services of large call centres to chase donations, and have massive marketing budgets and celebrities queuing up to lend their support. In comparison to these multi-million pound charitable organisations, Forever Manchester is relatively small, with an income of just over £3million and staff team of sixteen. But each year 85% of our income goes to fund and support over 1,000 community projects which directly benefit over 290,000 people. Yes, that’s right for every pound donated to Forever Manchester, 85 pence goes to support community activity across Greater Manchester. The remaining 15 pence is split between administration costs and marketing costs. The people and projects that Forever Manchester support are not even on this list – they are not registered charities they are grass-root. They are run by ordinary people like you and me – ordinary people trying to make the lives of friends, family members and neighbours better and happier. From Offerton to Oldham, from Levenshulme to Little Lever, from Sale to Saddleworth, Forever Manchester raises money to support the communities where we all love, live and work. Communities where past, present and future generations can thrive. Well… for a start over the next 20 years we’re going to see some major differences in the way we live. Long term economic solutions to deal with future public spending on health, long-term care, pensions and social benefits will need to be found and the way we care for children and the elderly, the labour market, education, technology and housing will all need some serious re-imagining. Greater brains than ours are working on these solutions but to us one thing is certain, our local communities will play a central part in delivering those solutions. Why? …. Because all the major ingredients that make for a happy, fulfilling life grow out of our communities. Real community thrives on taking part, where passion and shared interests are the key ingredients. Real community delivers a set of unrivalled opportunities — to connect, make friends, share, interact, help, care and discover — things that you just can’t replicate with government or corporate strategy. Real community helps deepen and refine our sense of inclusion, belonging and place, it bring out the best in us. This is where Forever Manchester fits in. Our role is to be the champion of local people who are prepared to do extraordinary things to make our communities thrive and to make sure that the talents, skills and assets that we all possess get a chance to be put into action. This is where we make a difference, this is where you will see the real difference your donations make. Where small amounts of money get big results. This is where charity stops and investment in all our futures begins. We are all extraordinary people, we have the power to create happy, abundant, resilient thriving communities, the freedom to create our own vision of the future and the power to make that vision come true. So if you were born here, educated here, make your living here, had your family here or just came to party and never left; if Greater Manchester has made you; you have to put something back, you have to use your success to create the future. Become part of the Forever Manchester family of supporters and get involved now.